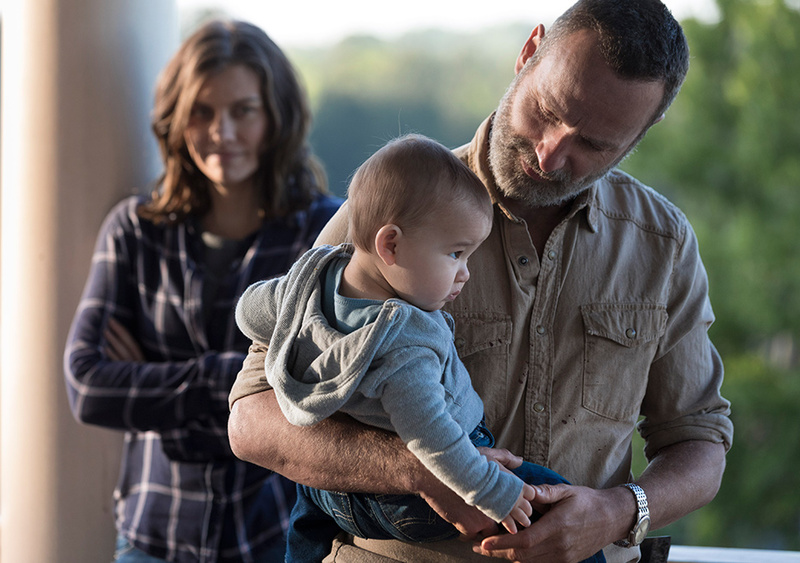 Maggie (Lauren Cohan) and Rick (Andrew Lincoln) introduce baby Hershel in Season 9 of The Walking Dead. Photo by Jackson Lee Davis/AMC. It seems that Maggie and Daryl are at odds with Rick in the season premiere, “A New Beginning.” There’s been a year-and-a-half time jump since the All Out War and the different communities are making new beginnings for their inhabitants. During a roadtrip to Washington D.C., Rick’s Gang commandeers tools and seeds from a doomsday vault within the American History Museum, using so many flashlights (where’d they get batteries that still worked? ), this really felt like an undead scene of The X-Files. Jadis now talks like a normal human, under the guise of “Anne,” Ezekiel proposes to Carol and Daryl has gotten more dialogue and action, now that he’ll soon be the main star of the show. Maggie has been elected the mayor of Hilltop and her baby’s name is Hershel. Someone’s remembering Negan fondly at The Sanctuary, which Daryl is now in charge of rebuilding. Gregory’s up to no good, challenging Mayor Maggie’s authority and trying to take back Hilltop, later getting hanged as punishment for attacking her. Rules need to be set in stone and Michonne sets plans in motion to create a charter among the communities of Alexandria, Hilltop, The Kingdom and The Sanctuary. Riding horses is now the primary form of transportation and the death of a young boy from Hilltop (I don’t remember Ken for some reason) causes a stir among the Hilltop crew. Daryl is pretty wasteful with his arrows (like he’ll be able to find more at a nearby store) and there’s a new introduction to the show, which feels a bit too long. All of this definitely feels like a new chapter of the TV show. With all of that crammed into a 90-minute episode, The Walking Dead has now ballooned to featuring too many actors, as a show. IMDB lists this episode alone with 39 people, many of which are new to the series who received very little dialogue, if any at all. But wait, there’s many more to come later this season. Alpha, Beta, Magna and Yumiko are just a handful of new characters who have yet to make their small-screen introductions. Fans of the comics already know about them, but fans of the TV show will soon meet them. And who is Dan Fogler’s mysterious character, Luke? For some reason, there has been very little publicized about him, although we’re big fans of the actor. We cannot wait to see how he factors into the Zombie Apocalypse within The Walking Dead Universe. Negan has yet to get any screentime, but the next episode’s preview looks like he’ll be back with more monologues. And where’s Lucille? Inquiring minds want to know! And bring on the Whisperers! This really looks to be a make-or-break season for the show. Executive Producer Greg Nicotero says it will return to its Western roots, so that already sounds good. I guess we’ll see if it lives up to those expectations.